We explore the reasoning behind using frameworks in microservices development before looking at how the OS framework, Axon, works. The choice of using a framework for application development is somewhat controversial. You might have a look at this blog by Peter Kummins, which argues against the use of frameworks in general. More specific to the field in which my organization, Axon operates, father-of-CQRS Greg Young is known for advising “don’t write a CQRS framework,” and DDD authority Mathias Verraes recommended on Twitter not to use a framework for applications that have to last multiple years. This article by Tomas Petricek makes some other interesting points, clearly distinguishing between libraries and frameworks, and advocating for the use of libraries over frameworks. 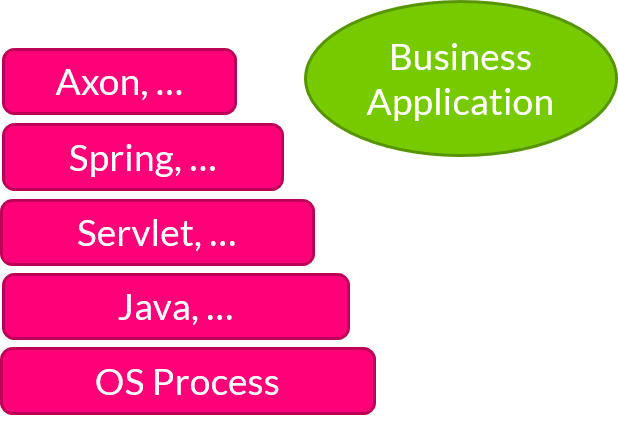 The idea of writing a business application without using a framework is somewhat of a mirage. You might start such a project by using the Java platform and start your code in public static void main(String args). But does that mean you’re not using a framework? No, it doesn’t. The Java platform is providing a huge layer of abstraction over the operating system and machine you’re working on, and this platform is the thing that is invoking the business application code. So, the Java platform is a framework. You may choose to use something even more primitive, but there is no real escape – it is frameworks all the way down. In reality, most developers don’t start by implementing a standard program entry point like this. Most business applications implement some web-based interface and rely on some abstraction layer to create entry points to the application other than a main method. For instance, this could be a Java EE HttpServlet, a JAX-WS @WebService, or a Spring Web @RestController. This relieves the application developer of the burden of thinking about HTTP protocol implementation and connection management — the framework takes care of this. Axon is a framework that implements reusable code in the area of CQRS, DDD, and event sourcing. It implements the notions of command, event, and query messages, with the associated buses and handler methods. This leads to location transparency: the buses can have local or distributed implementations without changing the business logic code. For DDD, it implements core notions such as Aggregateand Repository. To enable event sourcing, it implements the notion of applying an event to an aggregate, the event store, and an event-sourced repository. If you want to check out Axon yourself, you can download the quick start package here. Published at DZone with permission of Frans van Buul . See the original article here.